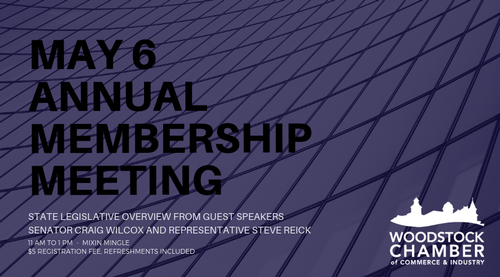 Join us for an annual membership meeting of the Woodstock Chamber. This is a member only event. The agenda will include review and revision proposal of current chamber by-laws. A financial review of 2018. Budget overview for 2019. Overview of Real Woodstock and Chamber collaboration/partnership and advertising co-op opportunities for 2019. Annual sponsorship and advertising opportunities for 2019 and beyond. Chamber board member term renewal review and vote. State legislative overview from our guest speakers Craig Witlox and Steve Reick. Members will listen and watch the board run the annual board meeting. Members will have an opportunity to take notes, ask questions and make comments for the record. $5 registration online or $10 at the door. Please register so we can insure there is enough space to accommodate everyone. Refreshments will be provided as a light lunch.